Can the President Cut Support for Congressional Foreign Travel During the Shutdown? Last week featured significant developments in the law and policy of congressional foreign travel. On Thursday, Jan. 17, President Trump refused to allow Speaker of the House Nancy Pelosi to use U.S. military aircraft for a congressional delegation to Belgium, Egypt and Afghanistan, purportedly because the trip would have been an improvident use of resources during the government shutdown and because Pelosi’s absence from Washington would have interfered with the progress of negotiations over the border wall. The president explained that the delegation remained free to travel by commercial airlines, but after legislators made commercial flight plans, the administration allegedly leaked the details to reporters. Advised that the trip had become unsafe in light of these disclosures, Pelosi was forced to cancel. 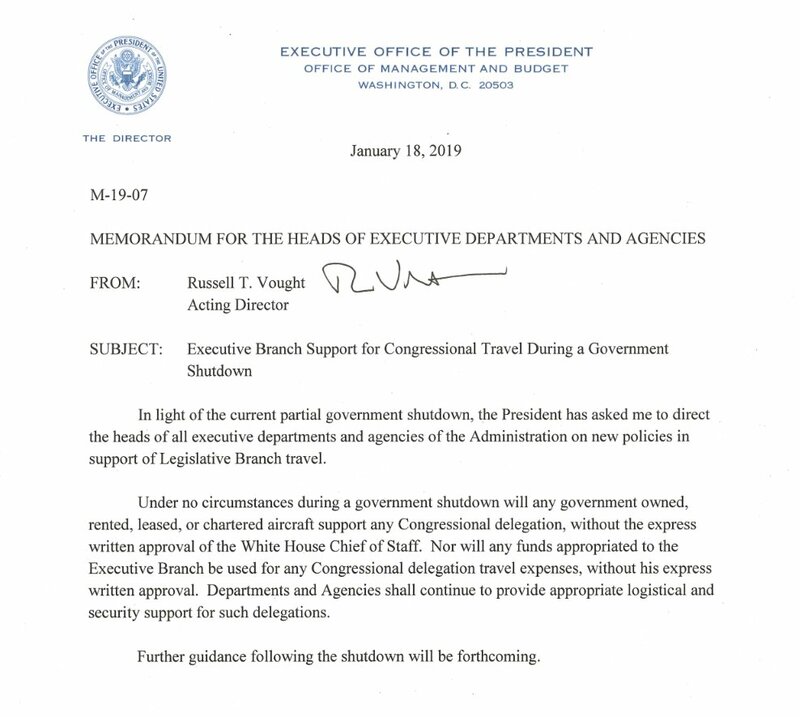 In light of the current partial government shutdown, the President has asked me to direct the heads of all executive departments and agencies of the Administration on new policies in support of Legislative Branch travel. Further guidance following the shutdown will be forthcoming. First, the policy does not cut all funding for congressional foreign travel. Section 502(b) of the Mutual Security Act of 1954 provides that certain local currencies owned by the United States government “shall be made available to Members and employees of the Congress for their local currency expenses when authorized” by congressional leadership. Because the Vought memorandum only addresses funds that are “appropriated to the Executive Branch,” it has no effect on Section 502(b) funds. As long as these funds otherwise remain available during the shutdown and are sufficient to cover all expenses, there is no reason to think that members of Congress are now financially unable to travel. Lack of access to U.S. government aircraft will, however, make travel less comfortable and, more importantly, less safe. In that sense, the new policy could have the effect of significantly decreasing congressional foreign travel for the remainder of the shutdown. Depending on how long the stalemate lasts, the result could be a Congress that is materially less informed on the latest developments in foreign affairs. Second, the policy might be inconsistent with federal statutory law insofar as it applies to executive-branch resources and funding that are otherwise available during the shutdown. Consider 31 U.S.C. § 1108, which governs the preparation and submission of agency appropriations requests to the president. One part of the statute provides that, “when requested by either House of Congress,” an agency may submit to Congress or one of its committees “an appropriations estimate or request, a request for an increase in that estimate or request, or a recommendation on meeting the financial needs of the Government[. ]” Section 1108(g) then states, "Amounts available [to an agency] under law are available for field examinations of . . . [the] estimate. The use of the amounts is subject only to regulations prescribed by the appropriate standing committees of Congress." As explained in a 1984 memorandum from the comptroller general, “[t]his provision . . . has long been held to mean that the use of agency appropriations for the traveling expenses of congressional committee members and staff is authorized when the expenses are incurred incident to the examination of estimates of appropriations in the field.” In other words, Congress can use Defense Department funds—or those of any other agency—to travel abroad for the purpose of evaluating any aspect of that agency’s budget. Moreover, by providing that this use of funds is “subject only to regulations prescribed by the appropriate standing committees of Congress,” § 1108(g) seems to preclude the president from dictating whether or how the travel expenses are incurred. If that’s correct, then circumstances could arise in which the Vought memorandum violates § 1108(g) by insisting that no “funds appropriated to the Executive Branch [will] be used for any Congressional delegation travel expenses, without [the] express written approval” of the White House chief of staff. All that would be necessary to trigger the violation is for members of Congress to seek to conduct a field examination in relation to an agency for which previously appropriated funds are otherwise available during the shutdown, and for that agency to refuse to use those funds to facilitate the trip. As a general matter, it is of course true that the president can rescind or defer the spending of authorized and appropriated funds, but the Congressional Budget and Impoundment Control Act of 1974 provides that he can do so only by obtaining approval from Congress in the case of rescindment, or by providing prior notice to Congress in the case of deferral. Because neither appears to have happened here, it seems plausible that the new policy could end up violating the U.S. Code. To be clear, I have not found any commentary on § 1108(g), so I offer this conclusion somewhat tentatively, but it strikes me as worth considering, and I’m interested to know whether others might agree. Finally, I want to flag a couple of separation-of-powers questions. One concerns impoundments: assuming the foregoing analysis is correct, does Article II nevertheless provide a basis for the president to countermand § 1108(g)? Comparable questions arose in the 1940s, when President Truman refused to utilize certain funds appropriated for the Air Force, and in the 1970s, when President Nixon impounded billions of dollars to undermine programs he disliked. Insofar as Congress seeks to travel by military aircraft, the precise issue is whether Congress can use its power over appropriations to dictate the manner in which the president exercises his authority as commander-in-chief in relation to specific military assets. I suspect that many will be sympathetic to the president’s position in this regard. At the same time, it is not at all clear that the president’s status as commander-in-chief empowers him to categorically withhold the aircraft and funding of not only the Defense Department, but also every other agency. The other question concerns Congress’s powers of oversight and investigation: at what point does a presidential burden on the use of those powers become so significant as to be unconstitutional? Or from a slightly different angle, at what point, if ever, does the customary status of executive-branch support for an official practice of Congress have the effect of making that support mandatory rather than merely permissible? Foreign travel is not the quintessential mode of congressional investigation, but it has become an important type, especially in relation to foreign affairs, and it has a long history. Given the presumably short-term nature of the shutdown and the continuing availability of funding under Section 502(b), it is easy to imagine much greater burdens. But it is also possible that the shutdown and the travel policy will continue for much longer than one would hope. Given other recent instances of opposition to congressional foreign travel on the part of the administration, it is also conceivable that the president will seek to retain aspects of the policy even after the shutdown. In either case, I suspect that the policy would become increasingly difficult to justify.